The Tunnel de La Croix Rousse runs from the Rhône to the Saône under the hill that leads up to the Croix Rousse neighborhood. Last summer during the heat wave, Hugo and I took a stroll from one side to the other, and the cool, cement tunnel was the perfect refuge from the heat. 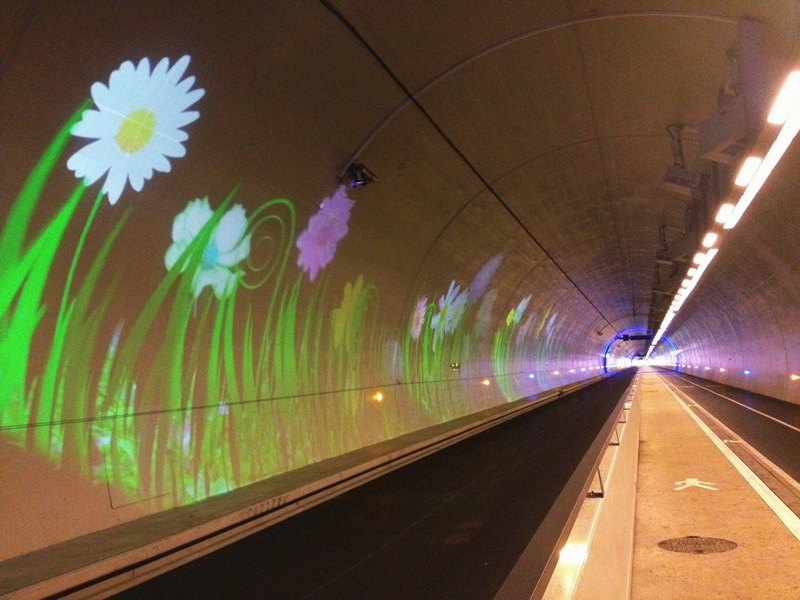 What makes it fun is that there are animated light projections all throughout the tunnel with music, kind of like a mini Fête des Lumières. Its about 1.8 kilometers across (or just over a mile) and you can walk or bike through it. How to get there: Enter from Quai André Lassagne on the east side, or from Quai Joseph Gillet on the west side. There are many places in Lyon where you can get a nice scoop of something cold, but I always go to Vieux Lyon. 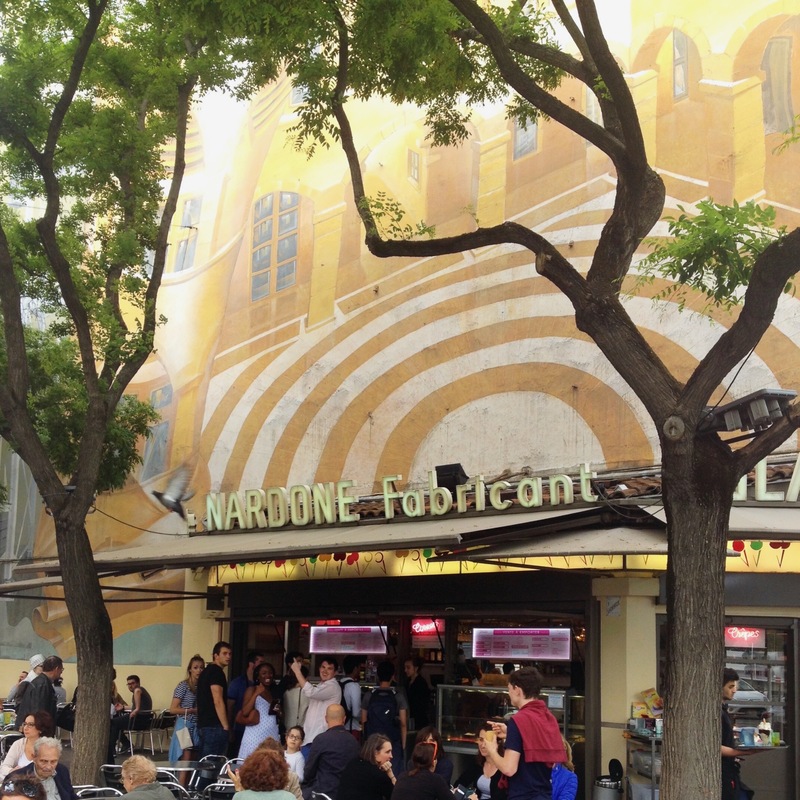 My favorite place is Terre Adélice (which is known for its extensive flavor offerings) and René Nardone is popular as well. They’re right around the corner from each other, so you can even try both if you want to see who really makes the best glace à la menthe. You’ll probably have to wait in (a massive) line, but then you get to stroll the cobblestone streets with your sweet treat. The Lyon opera house is a landmark in the center of town. It’s a popular meeting spot since it’s right next to the métro, and during the day you often see people breakdancing on the shiny black stone terrace. In the summer, this space turns into an outdoor jazz club with a bar. There are free shows on Monday through Saturday at 7 pm, 8:15 pm, and 10 pm. Go early to snag a table. How to get there: Take the métro to Hôtel de Ville – Louis Pradel. Vélo’v is the name of Lyon’s bike sharing system – you’ll see the red bicycles at stations all over town. They are incredibly cheap to rent, especially if you’re staying awhile, and Lyon is conveniently flat (except for the massive Croix Rousse hill!) If you’re able to ride a bike, it’s a much nicer than the muggy metro in the summer. Île Barbe is a little slice of an island in the middle of the Saône river, about 6 km north of Presqu’île, the city center. It’s the perfect place for picnicking, swimming, and snapping pictures of the sunset. Don’t forget to stop at Boulangerie Jocteur on the west side of the Saône. 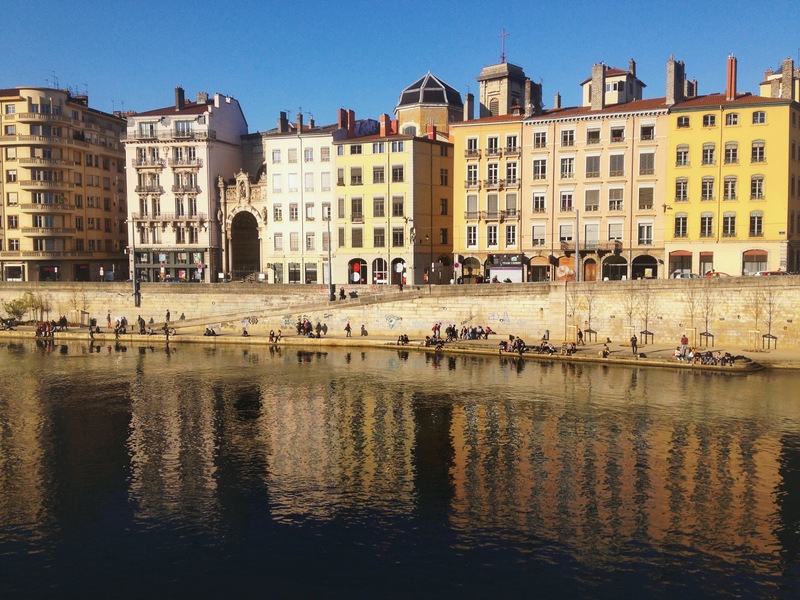 You don’t have to go far to take a dip in Lyon. You can hit up one of Lyon’s municipal pools. Centre nautique Tony Bertrand is right next to the Rhône near Guillotière, but there are other (cheaper) pools in the city as well. The regular entry fee at Tony Bertrand is €8 (or €5.50 for students under 26), whereas Piscine de Gerland, Piscine de la Duchère, and Piscine Jean Mermoz all charge €3.40 (or €2.60 for students). You can see a complete list of swimming pools here (some are indoor pools). 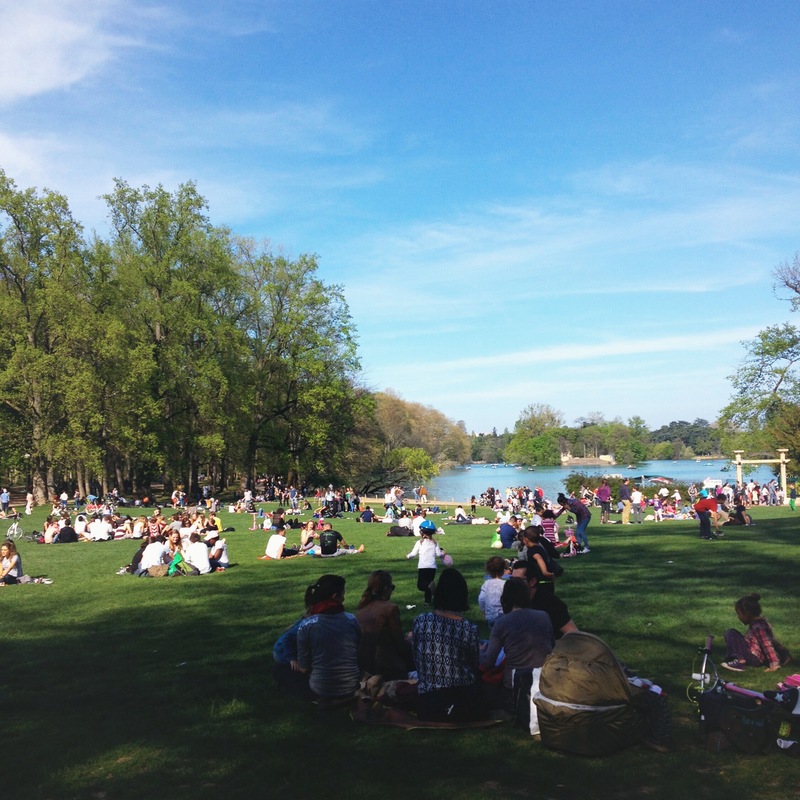 What is summer in Lyon without Parc de la Tête d’Or? Take advantage of the sunshine and explore the botanical gardens, stroll around the lake, admire the roses, or gawk at the many exotic animals in the free zoo. (You may be tempted to kidnap the cuddly red panda.) You can also rent a paddle boat, explore by bike, or settle down on the grass for a picnic with friends. How to get there: Take the métro to Massèna and walk north to the entrance. The biggest markets are on Quai Saint Antoine (Presqu’île) and Boulevard de la Croix Rousse (Croix Rousse) every morning but Monday. I particularly like Marché Saint Antoine because you can have a picnic with a beautiful view of the Saône river. You can also find some food trucks parked at a smaller market by Quai Augagneur Thursday afternoon and Friday, Saturday, and Sunday morning. I recommend picking up a baguette (from one of my favorite boulangeries, obviously!) charcuterie, cheese (if you’re into that), and maybe some of that tapenade you bought. This giant green space on the northeast outskirts of Lyon dwarfs the sizable urban Parc de la Tête d’Or. It has just about everything; you can bike, play golf, stroll, hike, picnic, go kayaking or stand-up paddleboarding, or just enjoy the beach. How to get there: Take métro A to Laurent Bonnevay and then take bus 83 to Grand Parc Miribel Jonage. The bus ride takes a little over 20 minutes. You can have a beer and burger in the sun at the popular Star Ferry (definitely go early to get a table), enjoy some music at La Marquise, or hit up Le Sonic for a late-night rock club scene. There are big cruise ships and little motor boats that float up and down the Saône, but you can also sail down the river by hopping on the water shuttle that runs down the Saône river to Confluence in the summer. It’s an inexpensive way to see one of the prettiest parts of Lyon by boat. There are four stops: Vaise (24 Quai Arloing), Saint Paul (Quai de Bondy), Bellecour (Quai des Célestins), and Confluence (Place Nautique). It costs €2 (buy tickets on board) and for the return from Confluence, it’s €1 with proof of a purchase at Confluence from the same day. It runs from about 9:30 am to 9:30 pm with departures every hour. If you’re heading south towards Confluence, the first departures are around 10:10 am. See the schedule for more information. The other good thing about Part Dieu in the summer? It’s les soldes – the summer sales. Almost all retail stores have major sales from the end of June to the beginning of August. If you’re in town in August, always, always double-check opening hours. Many places shut down for several weeks or even the entire month. Looks wonderful! I still haven’t been to Lyon but when I do get there, I’ll be sure to reference this post. The riverboat bars look great! Yes, it’s so beautiful in warmer months (but don’t come when it’s too warm because heatwaves in Lyon are the WORST). Honestly, most the things I love about Lyon in the summer probably pertain to Lille also. Sun, rosé outside… that’s all I need! These all seem like wonderful ideas of things to do! We’ve been hit with heatwave after heatwave since the end of May. And as there’s no A/C in the metro (at least the line that runs by me), I haven’t been to the center in a month or so now. It’s too miserable and dangerous for me at the moment. If it ever cools down enough, I’ll have to check some of these things out or else they’ll have to wait until next year. I know, it sounds like the heat has been really awful this summer!! I am a weirdo and I still check the weather in Lyon, and it looks like it’s cooling down a little this week 🙂 I wish that I knew the 7th, 8th, and 9th better, I’m sure there are lovely things to do in those areas that I just don’t know about. Good luck with the Lyon heat, I hope you’re able to escape it one way or another! It’s cooling down this week, but we’re going to visit the in laws. When we get back, the temps are supposed to be HOT HOT HOT again. Renting a south facing apartment was not a good idea… the dogs and me are miserable. Oh noooo!! I hope it will get better. I can’t even imagine how miserable the heat must be! Fingers crossed that you’re having some cooler weather now. Omg I miss it so much! I miss YOU so much! I miss you too!!! I should have put “take photo walks with Jill” on this list but it wouldn’t really be fair to everyone else 🙂 What would you add?! I always look forward to your posts! France is my heart. God Bless! I’ll be exploring Lyon for the first time in August! Looking forward to trying a couple of your suggestions. That’s awesome!! I hope you have a wonderful time in Lyon. If you have any questions about visiting please let me know! Great post and tips about Lyon! We love reading posts like yours, it’s great to see people like you enjoy our beloved city. As you lived in Lyon would you answer some questions on how you experienced France? 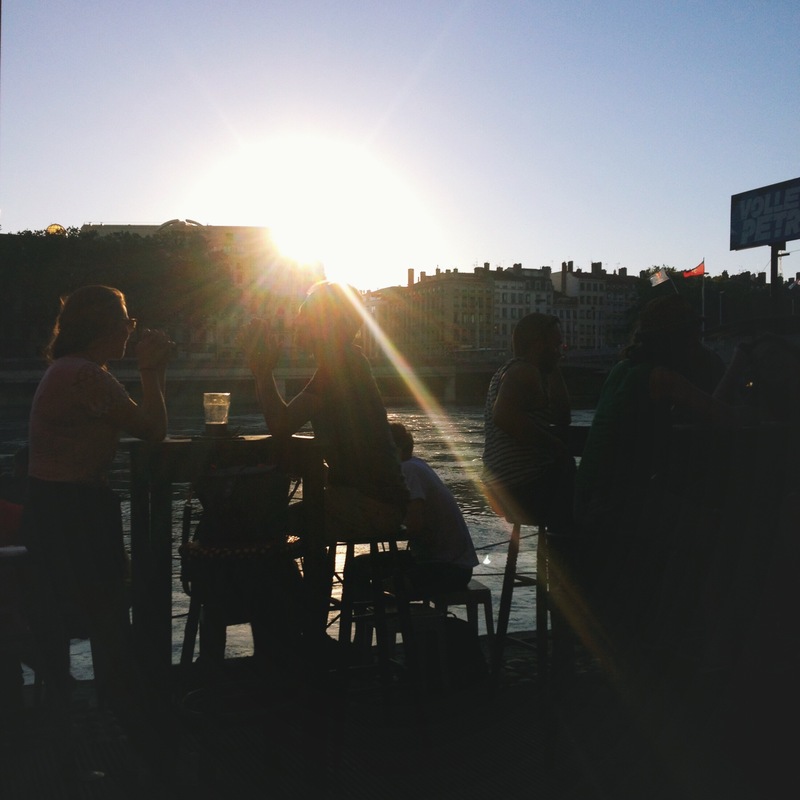 We also shared insider tips on what Lyonnais do in Lyon in July. Hope it can help your readers. I never made it to Grand Parc Miribel Jonage and had no idea the interior of the Tunnel de la Croix-Rousse was so jazzy! I was a ten minute walk from Parc de la Tête d’Or when I was in Lyon, so I spent many an afternoon there once classes finished and the weather was warmer. I wish British parks would provide water fountains like the French parks do, as it makes staying in the park for hours on end feasible when you can easily top up a water bottle! Worth the wait then, by the sounds of it! It was definitely a plus, and offset the inconvenience of having no garden/ backyard/ living room. I think if I’d lived further away from it, I probably wouldn’t have gone as often! I love this!!! 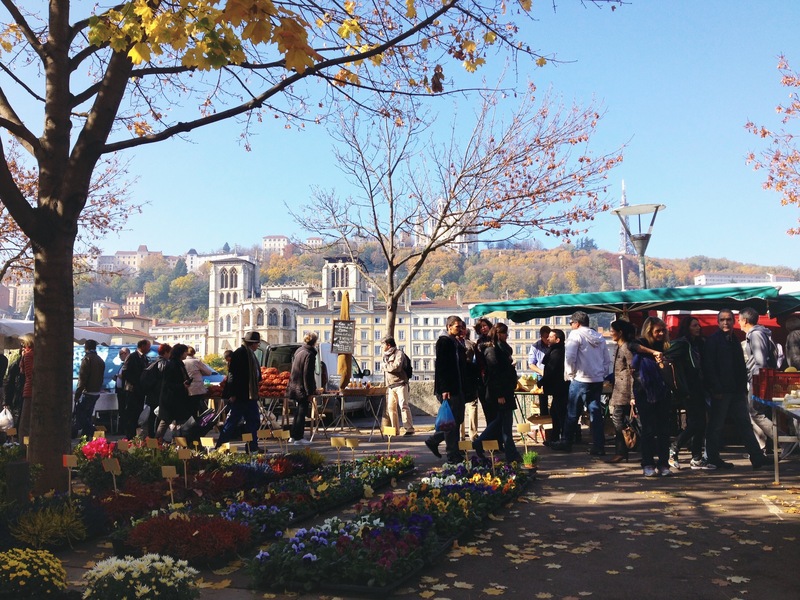 I never got to experience Lyon in the summer, but catching the tail end in September and being there in May just as things were starting to warm up gave me a taste of the beauty of the city 🙂 I love love love the market on Quai Saint Antoine… I used to go just about every Sunday morning! ❤ Also I heard that your TCL pass can get you on the vaperetto boat bus for free! I never got the chance to take it (too cold haha) but next time I go back I will definitely try! It sounds like you caught Lyon at some really nice times! Warm enough to enjoy the market, not so hot that you’re melting in front of a fan 🙂 I love the Quai Saint Antoine market too, it’s in such a beautiful spot!!! I love Lyon all year round 🙂 I’m glad you had a nice time there when you visited! Did you go in winter or spring? Let me know if you ever go back! It’s a lovely city year round! In my opinion, it’s the perfect French city for enjoying all your favorite French things without having to run around and visit everything. Let me know if you ever go! We were supposed to visit Lyon this year but our plans had to change at the last minute and unfortunately we never quite made it – this post is making me even more disappointed about it! I hope you’ll get to go another time! It’s a lovely city, and so many good things to eat! It’s beautiful year round, and it sounds like they are having a very hot summer this year. Let me know if you make it there eventually! Thanks, Clare! I agree, just a few months can change everything about a city. I love Lyon all year round so you can’t go wrong (as long as they’re not having an extreme hot or cold spell) but I personally love warmer months. A day in the park with bread and wine sounds like heaven! Rosé on a péniche sounds really good right now 🙂 If you can believe it, the bikes only cost 25 euros a year for residents – 15 for people under 25!! It’s hard to justify taking the metro after that! Thanks for reading, Erin! I’d like to visit Lyon, looks great!